3 lbs. 4 oz oz. 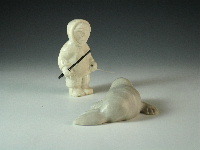 Inuit Hunter with seal skin bag and rod, standing on an ice flow with two seals underneath. Off-white stone with smooth polished finish.